Days of Our Lives (DOOL) spoilers has some late breaking casting news to report. According to Daytime Confidential and SOD, Tyler Christopher, who portrays Stefan DiMera on the NBC soap, has taken a temporary leave from the show for personal reasons. 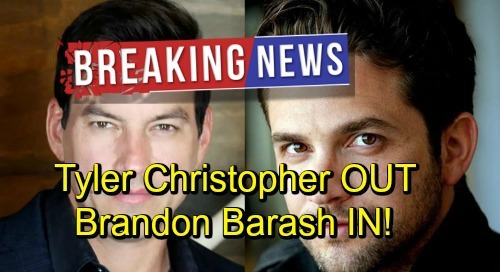 According to SOD Tyler left Days suddenly last Thursday, September 13 and his replacement, General Hospital’s Brandon Barash was already filming ad Stefan this week! Stefan first appeared on canvas earlier this year, when he was introduced as the never-before-seen son of Stefano DiMera (Joseph Mascolo) and Vivian Alamain (Louis Sorel). He’s been nothing but trouble for brother Chad (Billy Flynn) and Abigail (Marci Miller) ever since. There’s no word yet on exactly how long Tyler will be absent from DOOL, but it will be long enough to warrant at least a temporary replacement. Fan fave Brandon Barash, who most recently portrayed Johnny Zacchara on General Hospital, has assumed the role of Stefan while Tyler is on leave. Brandon Barash portrayed mobster Johnny Zacchara on General Hospital from 2007-2016 and worked alongside Tyler there, when Tyler portrayed Nikolas Cassadine on the ABC soap. Brandon was formerly married to General Hospital’s Kirsten Storms (Maxie) and the two have a daughter, Harper. There is no word yet on Brandon’s first airdate as Stefan. But since DOOL films almost six months in advance, it will be a while before he’s seen on canvas. Fans should look for Brandon’s version of Stefan to air sometime in 2019. It will be interesting to watch Brandon’s take on the evil and manipulative Stefan DiMera. We wish Tyler the best while he’s on leave and look forward to seeing him back! Stay tuned to DOOL and don’t forget to check CDL often for the latest Days of Our Lives spoilers, updates, and news. Days of Our Lives (DOOL) Spoilers: General Hospital’s Rebecca Herbst Headed to Salem – Contract Negotiations Go Downhill at GH?